Happy Friday! Tory Burch has a lot of beautiful items on sale right now (as many of you know they rarely have sales so this is great news!) 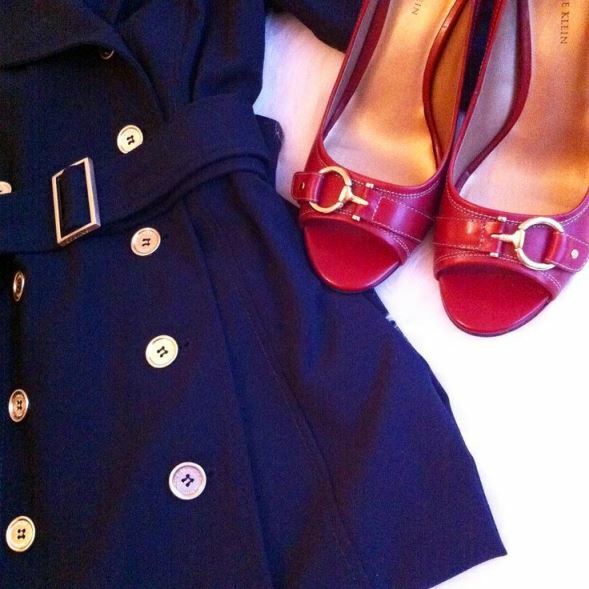 Today I'm sharing some of my favorite classy picks for fall. I've been a longtime fan of riding boots and Tory Burch in general who is known for their classic, well-made riding boots. They are the perfect go-to for both practicality and style and they are a lifesaver for me in rainy autumn season here in Florida, as well as easy to chase my toddler around in while pulling a more casual outfit together. They are an effortless complement to a poncho/cape (like this one) and long tee, paired with a sweater dress or jeans, tee + blazer. I was thrilled to see these boots as part of the sale in both brown and black! I also live in my black Reva flats year round-so comfy and they're the perfect polished flat in my opinion. I love this patent version and the wine color is so pretty. I have my eye on the pointy toe version as I don't currently own any in my wardrobe. I love the look of booties too-less bulky and can be worn so many different ways. I'm also linking to some elegant handbags on sale below also. Right now there aren't any details posted as to when the sale will end, so if you see something you like in your size don't hesitate to grab it as their sale item always sell out quickly! 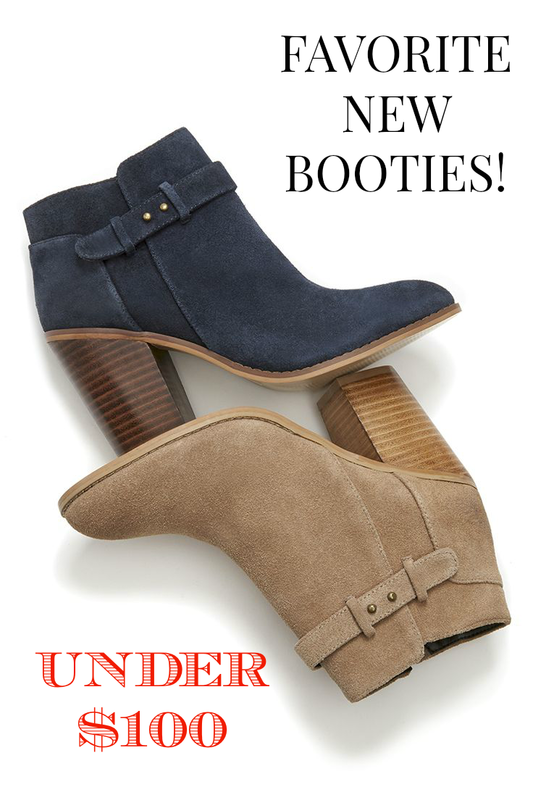 Be sure to check out all the amazing deals of sale footwear + sale handbags. One distinguishing characteristic that gives the classy woman an elegant look is the way in which she carries herself, excellent posture is a huge component of that. A lady does not slouch or sit hunched over at her desk or over a meal, she is careful to sit up straight and tall. This not only lengthens her torso making her appear slimmer, it also exudes poise and confidence. Taller women and young girls often feel a bit awkward or self-conscious about their height, especially if they tower over their male counterparts and tend to slouch just to blend in. Sometimes, women with larger than average chests also have a tendency to position themselves in the same manner as to not draw too much attention. Either way, it's important to embrace the body we have and enjoy it instead of attempting to hide it. If you're unsure exactly what proper posture is supposed to look like, below are some visuals of how your spine should look both when standing and while sitting. Whether your work has you standing in one spot, walking the floor or sitting for long periods either in front of a computer or on the road in a vehicle, it is of paramount importance to understand what proper posture should look like if we want to emulate, achieve or maintain just that. 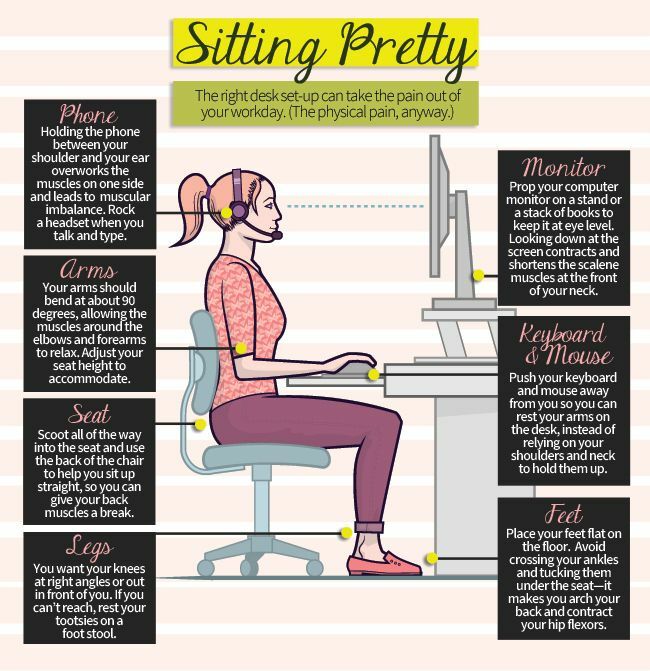 Let's face it, most of us spend far more time in a seated position than we do standing or walking. Below is a visual of the proper way to sit at your desk to ensure you maintain proper posture. 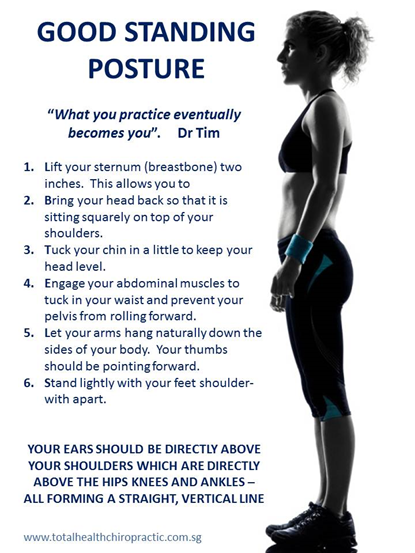 it is essential to get into a routine of using correct standing posture. 1. Raise the Bar While in the Car- While driving, you have an opportunity to create better posture. Firstly, a good seat support is a must everywhere you sit for extended periods of time, including the car. I have a little trick I use that actually came about while noticing that after a Chiropractic adjustment, my rear view mirror needed to be re-adjusted and raised. When our spine is more compressed, we sit lower in our seat however once that is released and our spine becomes elongated once again, we sit taller. Start by sitting comfortably, then raise your rear view mirror up just a bit forcing you to sit more upright to see properly. You'll likely need to re-adjust your side mirrors a touch also. Before doing this, remember to ensure your seat is in an ergonomically correct position. Keep your seat mostly upright with a slight recline and use your lumbar support and head rest adjustment to ensure proper position (not all cars have those options, but if yours does be sure to take advantage of them). Ensure you are sitting close enough to the steering wheel and pedals. When the driver's seat isn't properly positioned, it can create unnecessary strain, especially in your lower back. 2. Balance Yourself- Otherwise known as a fitness ball or balance ball (which you've likely seen in the gym), stability balls have many uses. One great tip is using it as a replacement to your office chair for even just one hour per day. Of course you can't lean back on a regular ball or you'd fall off of it, but that short time on it will cause you to train your core to become tighter and building a stronger back in the process. There are options for sitting on a ball longer, for example, an ergonomic balance ball chair (also here) is the perfect tool as it has a built in restraint bar to keep the ball from rolling all over. If you don't wish to use it at work, try it in your living room instead of sinking into the sofa to watch TV or read. 3. Strengthen Your Core- Of all the forms of exercise that exist, I personally love yoga (I used this wonderful DVD while I was pregnant with Lily), Pilates and ballet barre classes. I enjoy them most in a class environment but when I'm pressed for time, videos works well too. These all focus on a strong core, strength and flexibility, all of which are key components to good posture. There are so many amazing benefits to yoga in particular from the stress reduction aspect, deep breathing and stretching to the strengthening and flexibility that comes from holding poses for a length of time and twisting to open up various areas of our body for better detoxification and circulation. Yoga naturally helps release stress and builds a better posture while holding poses. Incorporating this into your workout routine is easy, even just a couple sessions per week will encourage a more properly aligned spine. If yoga is truly not your thing (I've never met anyone who hasn't liked it) then any form of exercise when using proper form will help increase your overall posture such as training with free weights especially focusing on the back and abdominal muscles to build strength or even maintaining proper form while running can help. 4. Get Reflective- For the same reason fitness centers line their walls with mirrors, you need to get into the habit of sitting near one also. 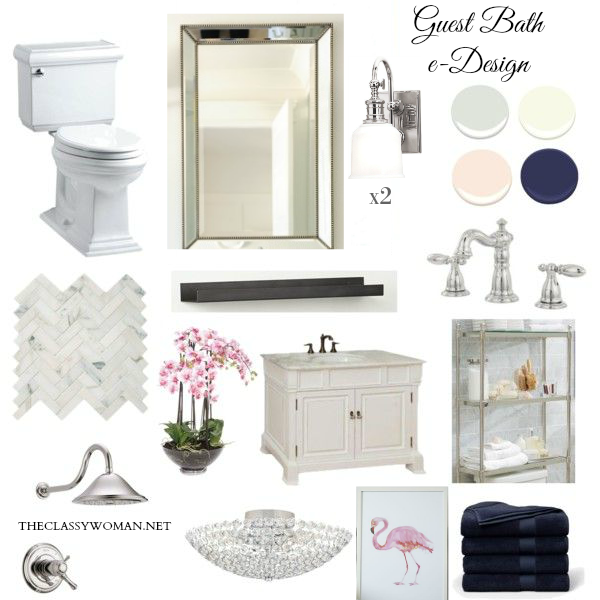 Buy an inexpensive wall mirror and place it against the wall where you work and take notice of your posture. Studying our reflection allows us to see where we need to make minor tweaks. Speaking of gyms, while you're there, whatever your chosen activity is, get in the habit of looking at your body in the floor-to-ceiling mirrors, focus on your muscle groups, the movement and of course your stance. I like to do this while stretching, performing yoga poses and using free weights most specifically. Over time, you'll notice once you pay attention to your posture, you'll start to see more favorable results because you'll be more apt to correct it. 5. Roll With It- Beyond exercise, stretching and being mindful of our posture, there is a really great tool that I've come to love and can't say enough good things about, it's the foam roller, but specifically the egg crate design foam roller-both are great but the textured design seems to work muscles out a bit deeper. They're intended for rolling out stiff muscles after a workout, allow for greater circulation, prevents lactic acid build up but mainly they're used to prevent and relieve muscle tension and soreness. While you can use it all over your body, I love that I can lay on top of it and roll it up and down my spine. I also find that when I roll out my hip and glute areas, I feel SO much better to the point that I actually crave using it twice daily. I've visited my Chiropractor much less since getting it and he even attests to the fact that it's an essential tool. I use it first thing in the morning before stretching for the day and again in the evening before bed. When our body feels good-stretched out and free from pain, we're far more likely to sit up without feeling aches that cause us to slouch. 6. Be Ergonomic- Some companies actually employ groups to come into the workplace to properly outfit their employees' desk space with ergonomic office chairs and desk heights that are appropriate along with proper positioning of computer monitors and the like. Sometimes having a small foot rest to prop feet up a bit takes strain off of the lower back. This knee chair with memory foam is said to be amazing. Look into this and if that's not possible or you work form home, be sure to invest in a really comfortable and ergonomically correct office chair. It also creates better overall alertness and focus so you'll be more productive too-bonus! If you're not ready to shell out the cash for a whole new chair just yet, this portable tool as well as this lumbar mesh back support also work to properly position your body while seated and are both inexpensive options. 7. Make Some Adjustments- A trip to the Chiropractor or Massage Therapist might be just what you need to help begin a better posture regimen. Sometimes our spine is misaligned for a variety of reasons (including all that slouching or the way we sleep at night) and we just need someone to get the kinks out. A massage is also a great place to begin to ease away stresses and pain that might be to blame. For me, massage is always a great reminder of the areas where my body carries the most stress or is weak (the hips are my worst area from sitting on the floor with a toddler playing and also sitting in front of my laptop for work) and I'm constantly looking for new stretches to keep those areas limber. 8. Re-train Yourself-If you feel your posture has slipped to a point where minor tweaks aren't going to help (after having attempted some already for a few months) and years of neglect have led to a hunched position, consider wearing a posture support. I have never worn one, I can't attest to how comfortable they are but if your goal is a straighter spine, consult with your medical practitioner and see if that might be a good option for you. The options today are modern and are easily put on as an undergarment underneath your clothes, so they're invisible to everyone else while doing their work. I especially like the idea of this Intelliskin sports bra. It's a matter of reading the reviews and seeing which ones are said to be most comfortable. Women with more voluptuous breasts might prefer this particular model. Posture supports are a tool that don't allow you to slip into your old ways if you forget to pay attention to the mirror or slouch back into your chair. The positioning encourages better alignment as you're wearing the garment during the day. This is not for everyone, but an option if you're feeling like it's needed. I've read of many singing their praises so it's definitely worth trying out. Yoga does far more than help create better posture, there are so many amazing benefits. 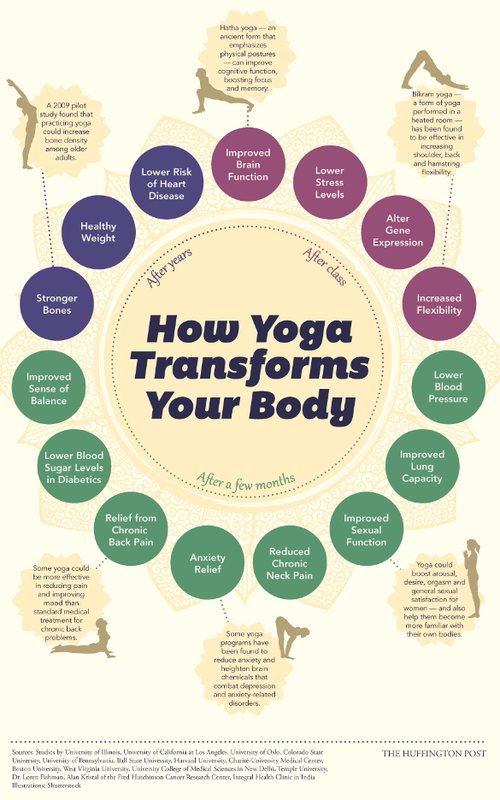 I love this yoga infographic that I came across which reveals how your body can become transformed anywhere from just a single class to years of regular practice. 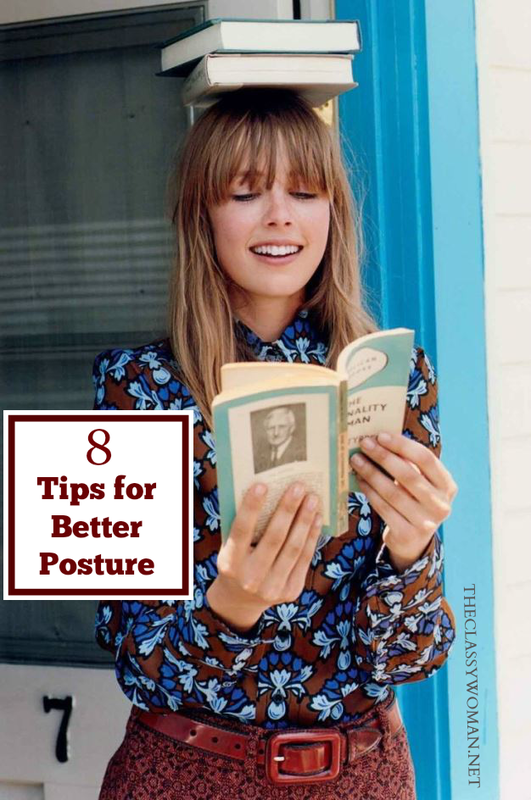 Improving one's posture has so many wonderful benefits. Consider that it allows for better digestion, provides a more youthful look (a hunched position is associated with aging), instantly creates a more slim looking physique (who doesn't want to instantly lose 5 lbs? ), allows for deeper breathing for greater circulation and better oxygen flow, elevates our mood and increases confidence. While keeping muscles strong is essential, stretching throughout the day is equally important. The more often you can get up, move around and stretch, the better you will feel overall. Intentionally taking breaks every 1-2 hours to refill your water bottle and stretch is an easy way to work it into your day. Welcome and happy Monday everyone! 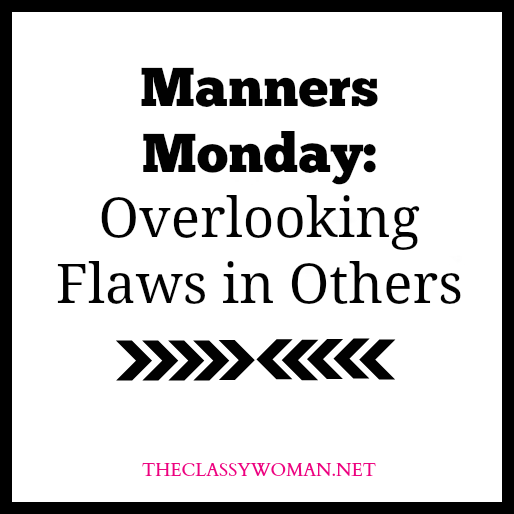 As I shared in this post last week, I'm finally getting back into the swing of things as it pertains to blogging more consistently (I'll be posting Monday, Wednesday and Friday going forward working towards posting on a daily basis eventually in the coming weeks), so I wanted to kick this week off with a new Manners Monday post! One of the qualities I most admire about some of my closest friends, is their ability to see the best in others. Let's face it, none of us are perfect and we all have shortcomings that we are in the process of working on to become a better person; whether it's becoming more patient, being a more compassionate person, showing up on time, keeping our word or learning to use a quieter tone of voice are just a few examples. These areas we're working on can serve as a reminder to others that we're all human and it's okay to be imperfect. 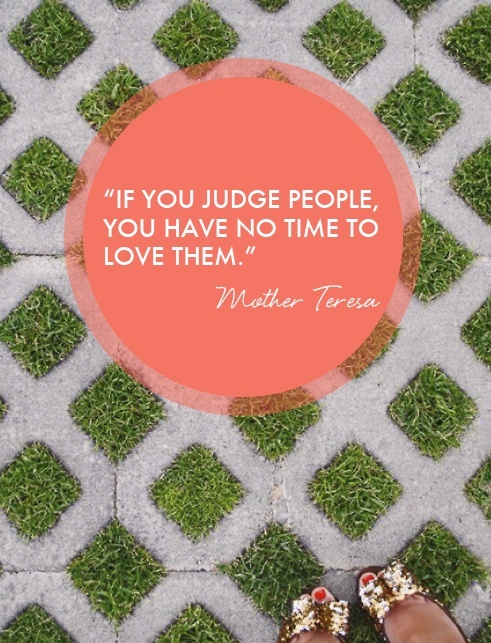 To truly love and appreciate others, we need to leave all judgement at the door. I find there are two types of people in life: those who immediately focus on someone's strengths and those who zero in on their shortcomings. It doesn't take much to notice the latter, but to look beyond and really see the heart, it speaks volumes about their character. 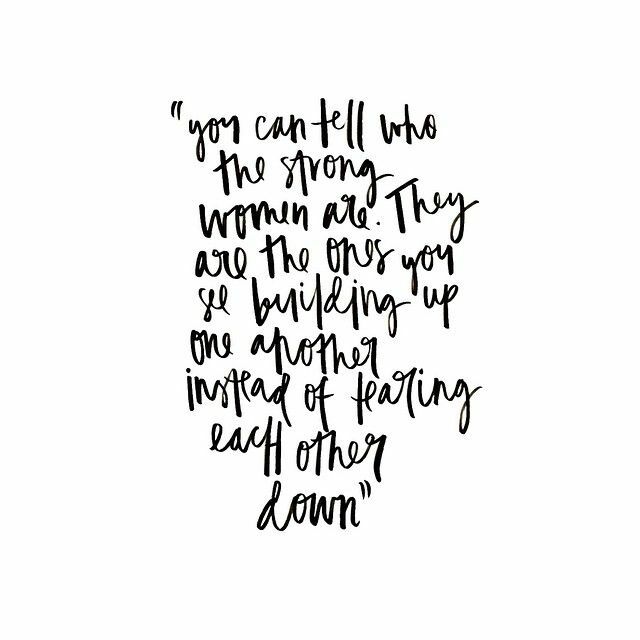 I don't know about you but I like to spend time with those who make me feel at ease and comfortable vs. walking on eggshells afraid to make a misstep. Not only is acknowledging strengths in others a form of kindness but it also a necessary component of good manners. 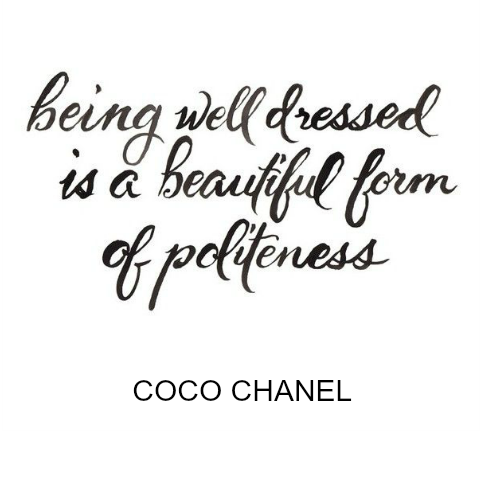 You see, no matter what we say, do or non-verbally convey, good manners will always make others feel confident and able to be themselves in our presence. Obviously, someone else's own insecurities are not are responsibility, but welcoming them into a space is. Also, it must be said that there are certain patterns that people will reveal to us repeatedly over time that we of course must pay attention to in order to decide if someone is a fit for our life, business, etc. While I've always enjoyed paying genuine compliments to others, there was a time in my younger years when I used to be more critical-of both myself and others. Gosh, before becoming a mother myself, I would leave someone's home (who has children) after a gathering a bit shocked at the level of chaos and mess that existed when I arrived, wondering if it was lack of attention to detail or if kiddos really just take over to that degree. Of course, now that I am a mother, while I pride myself in caring for my home the best I can, I will attest to the fact that toddlers make a lot of mess and babies come with a lot of 'stuff' and tend to produce a ton of laundry. Once my daughter began walking after her first birthday, I had to just resign to the fact that things would never be the same, they'd be out of place and probably often. Doing my best had to be enough, even if that meant the house wouldn't always look pristine. Allowing myself that grace has afforded me a new found respect for other parents and has also allowed me to extend that same grace to others knowing that we're all fighting that same battle. In fact, becoming a mother has changed the way I view so many things and has made me a more helpful, compassionate and understanding person in general. A classy woman looks for ways to compliment others, something good can always be found from the way someone decorates their home to the way they lovingly interact with their children. I have found that when we draw our energies to those positive attributes, that they are the ones that stand out in our heart and mind, and may possibly even be of value to us in the future. If we can ignore all the toys strewn about in a home but see the beautiful photographs a mother has taken and displayed of her children, perhaps she's a wonderful go-to when it comes to hiring someone for family or business-related photography in the future. The woman in your office who is habitually late but also happens to be impeccably dressed can become a source of inspiration. Although you wouldn't want to emulate her tardiness, she could be a great resource too as it pertains to style advice. Everyone has unique gifts, talents and special abilities that we may not share in common, we need others and others need us. However, if we spend all of our time critiquing, we will end up alienating people. One way to build trust in others and raise their confidence in an authentic way is to magnify their strengths. I find people are more apt to do this as it pertains to physical appearance (and that's awesome), but we need to dig deeper and really remind others who they are beneath their chosen hairstyle, makeup application or perfect selection of accessories for an outfit. I admire many things in others and I really try to make an effort to vocalize them whether it's telling them how I think they make an incredible pecan pie or letting them know I feel they have a a beautiful way with their spouse. Then still, it may be my sheer amazement of how certain individuals have the capacity to get so much accomplished in a week and still make time for family and hobbies. It's a great way to ask questions and pick someone's brain for ideas too. In the workplace, oftentimes we may be compensated accordingly for our time and effort, and may even receive a little pat on the back here and there, but there are many who thrive on recognition, in fact it keeps them going and encourages them to work harder to achieve more. I know this, because I'm one of those people! I have found that this is sorely lacking within many companies and it eventually leads to an employee feeling undervalued, under appreciated and can cause them to look elsewhere for employment, a new environment where they will be recognized for their contribution within their team as well as individual achievements. This is important to consider for those who run a business or are in management positions within a company. As wives and mothers, we are essentially the CEO of our own family and household, so this is an area to be mindful of to continue to build up the very people we love the most. It's easy to notice the things that irritate us especially when it comes to those who live in our home (I find this to be especially with my own spouse), we have to intentionally look for the good and remind people of who they are because they are not their imperfections. The most powerful thing we can do for our children is praise them often, reminding them of their strengths which will help propel them forward in confidence, acceptance and unconditional love. By changing our outlook and focusing on the positive in others, we can't help but create a greater level of joy and positive energy within our own lives in the process! When we're kind to others, we tend to be kinder to ourselves as well. HELLO Lovelies! It's been a while since I sat down to write a post here. I try to keep Facebook and Instagram current as they're quick tools for sharing but I've really missed spending more time here on my blog. I apologize for being such a sporadic blogger over the past year or more, life with a baby-turned-toddler and becoming a new mother in general has been such a wonderful experience but a totally new balancing act for me. After two years of having my Lily at home all to myself, we just enrolled our sweet girl in a wonderful private school and she is loving it and doing so well! She really craves being around other kids at this age (I can't believe how fast she is growing before my very eyes!) She began her first full day class on Monday and it has been amazing to see how much more free time I have to get work and other house-related things accomplished. During the past few weeks I've been working on some new post topics and I'm really excited about spending more time writing here and posting more consistently. I would love to share daily, since I'm just getting back into the swing of things, to start I'm aiming for 3 posts per week: Monday, Wednesday and Friday so I hope you'll join me here again and know that I haven't dropped off the map! ;) Also, if there are some post topics that you'd love to read about, leave me a comment or send me an e-mail. I'd love to hear from you!! 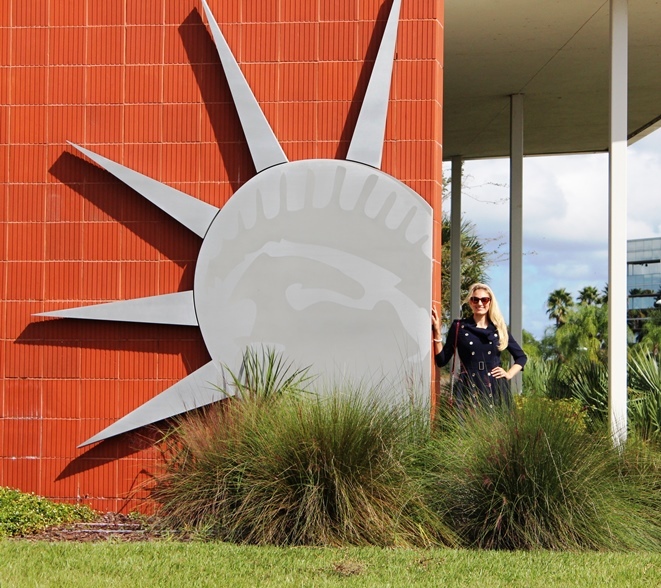 Onto some recent news....Many of you, especially if you've been following along here for a while, know that I'm Canadian and moved down south to Florida after marrying my husband nearly a decade ago. 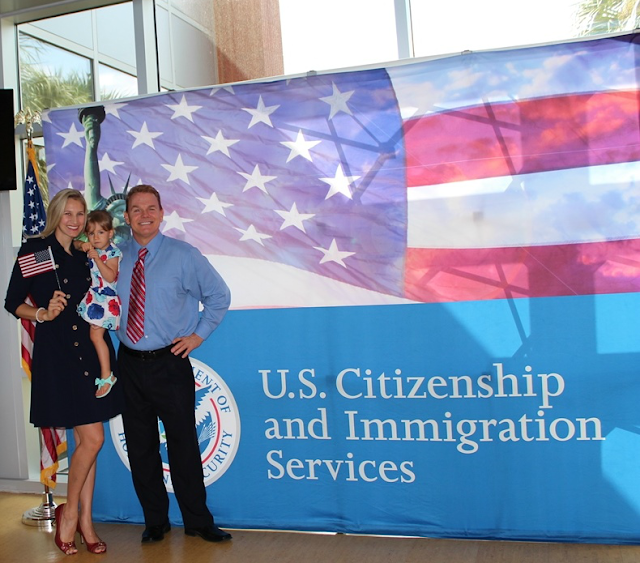 I'm excited and so proud to announce that as of 2 weeks ago, after living in the U.S. for 9 years I'm now officially an American Citizen!! Below I'm sharing a peek into my celebratory morning. 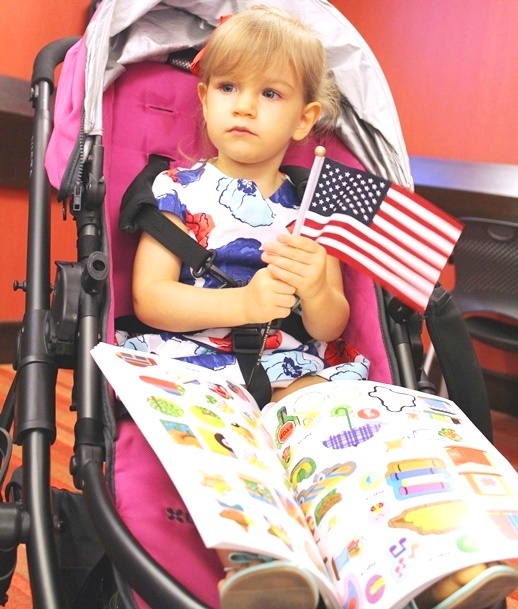 We made our patriotic look a family affair. Home countries were called alphabetically one by one, with all remaining to stand until the end when all countries had been announced. Here I'm clapping for and representing Canada! Excited to get started! Hubby was snap happy while waiting for everyone to arrive. 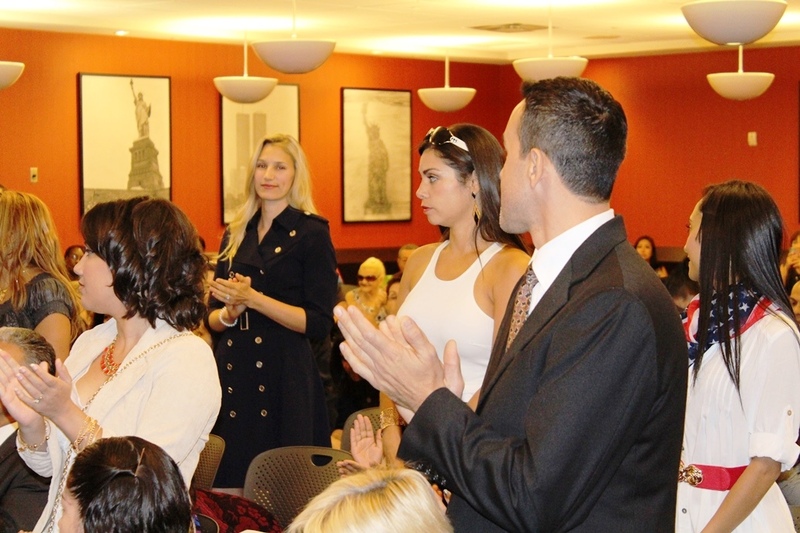 Raising my right hand during the oath. 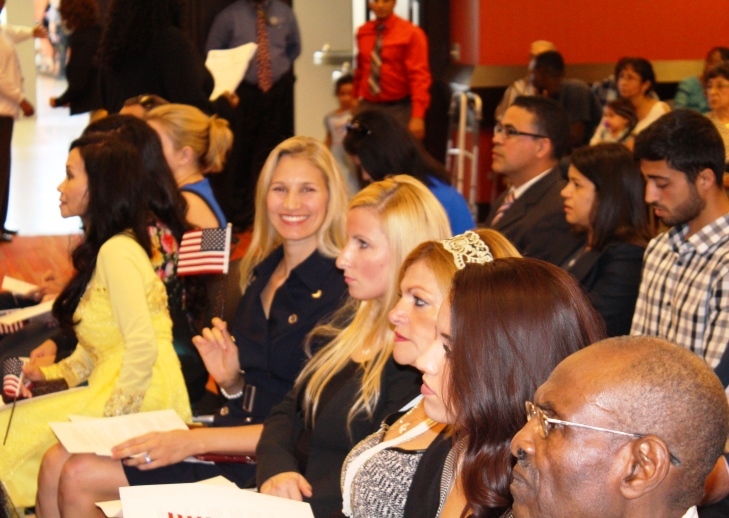 The Master of Ceremonies congratulating me on becoming a citizen. 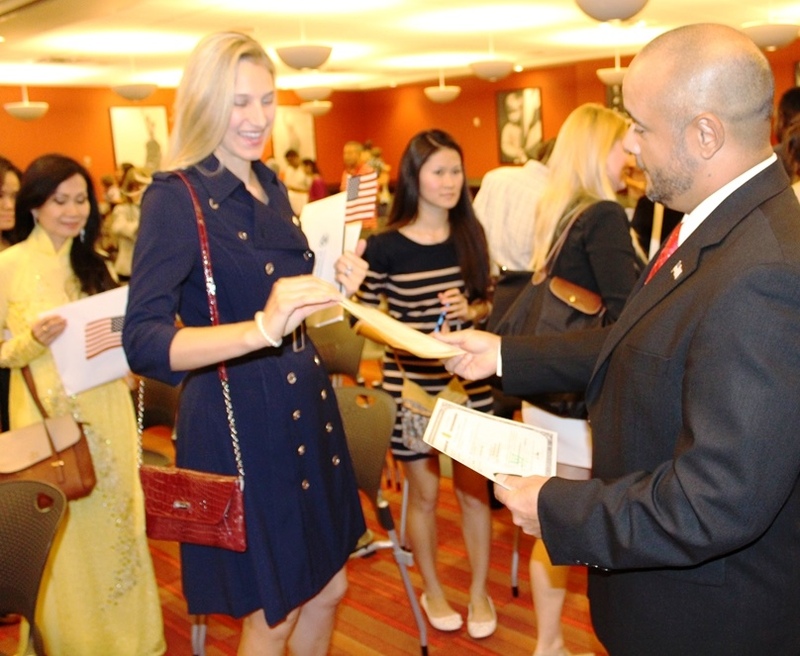 Receiving my Certificate of Citizenship. Next up: order my new passport + register to vote! 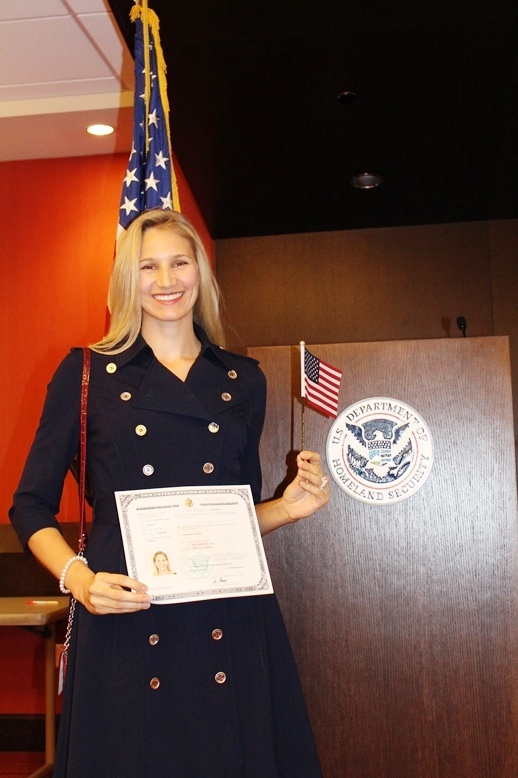 After applying for immigration and obtaining my work permit, I was pretty content with being a Permanent Resident and living in the U.S. I honestly had no real intentions of becoming a citizen at that time, it felt as though I'd be betraying my beloved birth country plus we had discussed potentially moving to Canada at some point in the future so I didn't feel the need. However, as time progressed Paul was applying for jobs in various countries and I realized that it would make it tricky for me to live there with him given the length you can leave and reenter the U.S. is six months. 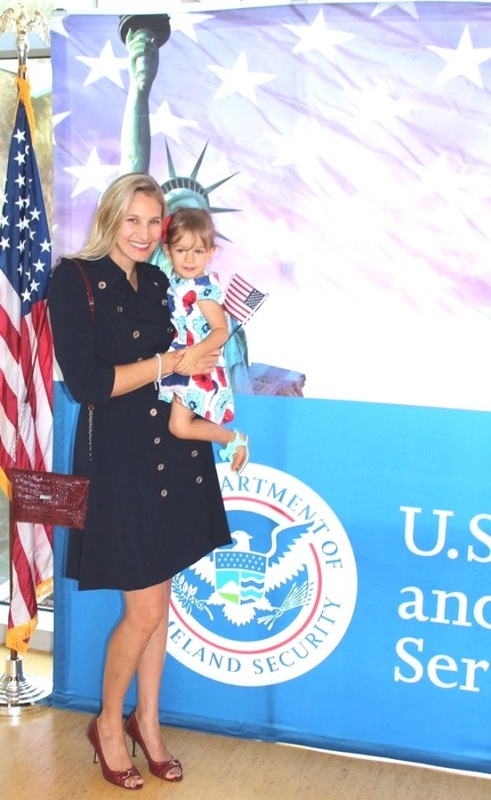 It wasn't until the birth of our daughter, Lily (who recently turned 2), that I realized I was the odd one out as she was born in this country as was my hubby. While I cared for her on my own here at five months of age while my husband took a position in China for 6 months, I knew going forward that I didn't want to relive that solo parenting lifestyle again and any future working/living abroad would need to be done as a family unit for everyone's sake. So, back in July I began the process of applying for my Citizenship, biometrics (fingerprinting) and then I awaited for my big interview + civics test. 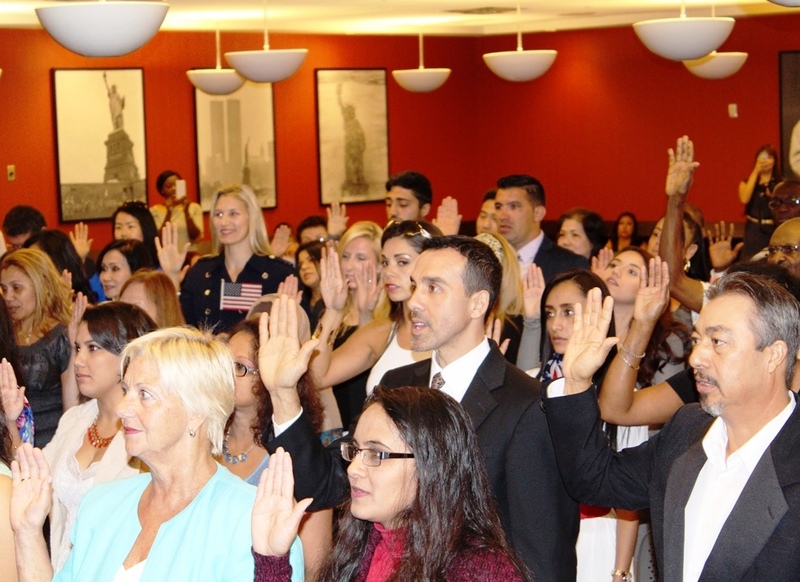 I learned a lot about America's history prepping for the test and after being told that I had passed and would be recommended for approval, I left knowing that the final step was just around the corner-the citizenship ceremony! 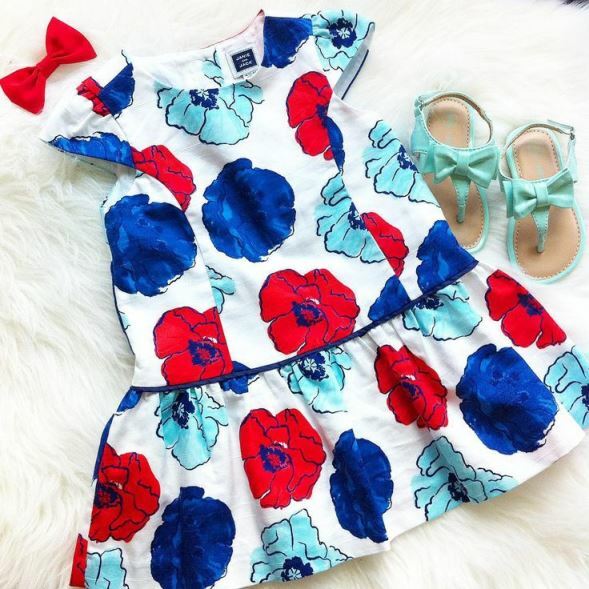 I had thought it would be several weeks before the date would be set, however, being the planner that I am I wanted to get a jump on my attire, so I initially bought this dress. My goal was to find a red, white and blue look for the day however, I realized after the fact that this particular dress was actually black instead of navy upon closer look but it's so pretty that it's a keeper. When I received my instruction letter just six days before the actual ceremony (which was only 10 days after my interview-so quick! ), I knew the dress I ordered wasn't going to arrive in time because of where it was shipping from. Given my time crunch, I decided to buy locally. When I came across a military-inspired Calvin Klein dress, it checked all the boxes I was looking for: fit perfectly without needing alterations, was navy and worked within my budget (I scored it on sale for $50)! It's perfect to wear into the cooler months of fall as well as early winter here and is totally different than any of the other dresses I own. When we left our house early in the morning it was already insanely humid and hotter than I was expecting (into the 90's at 8am! That's 'normal' by Florida standards during fall though) so we preferred mainly taking photos indoors (please excuse the darker/somewhat fuzzy photos as hubby isn't used to using my camera.). I had also intended to give my bare nails a deep red mani for a more polished look before we left however, my little one woke up earlier than expected and kind of took over my morning while her daddy was on a conference call but what can you do right? ;) Including myself there were 68 people from 28 different countries who all became American Citizens locally here on Oct.9th-it was a neat experience! Lily was entertained with her favorite sticker activity book (that I've now bought her for the second time because she loves it that much). Seriously, if you have a toddler-get it.) as Paul looked on and snapped some pics. I had to laugh though because at one point when it was quiet, Lily looked up and said, "Mama? Where's Mama?" Bless her little heart, she was so quiet and well behaved for over an hour sitting in her stroller next to daddy. There were a few times during the ceremony that I felt myself tear up and get emotional, in thinking back on my own journey and all of the steps involved but as they played a video in the background of what citizenship means to some (mainly for those who have overcome so much more than relocating within their own continent-who learned English as a new language, gained freedom that they never knew in their birth country, the new opportunities they had access to that they never knew possible before and how they had traveled so much further to even enjoy this day that we shared in common). 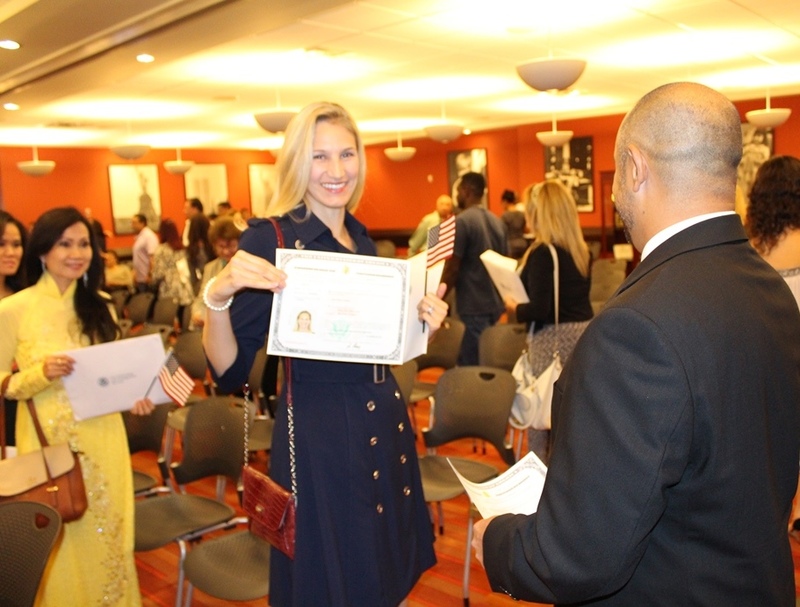 I feel so incredibly grateful and blessed to be a dual citizen, to have the ability to live and work in another country and now call both countries home! Later that evening Paul suggested that we celebrate as a family and headed out for dinner to Disney's Polynesian Hotel where we each had a delicious noodle dish at Kona Cafe followed by the best view of a spectacular fireworks display from Magic Kingdom which was done as part of Mickey's not-so-scary party, which we could see across the lake where we were. 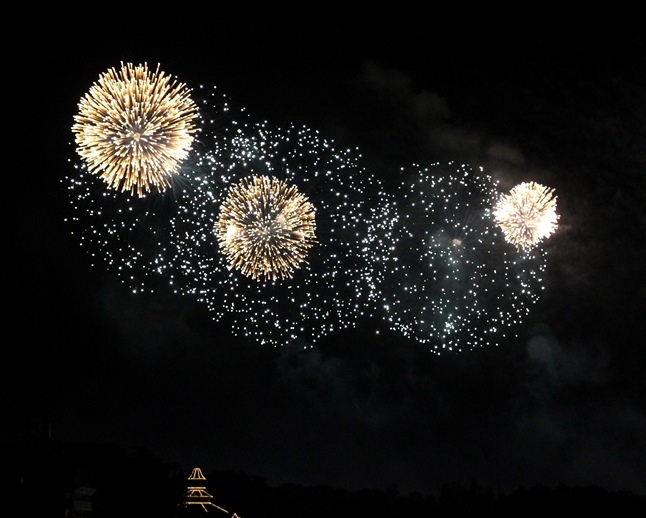 That's one of the perks of living in the Orlando area, you're able to see fireworks any night of the week. We tend to frequent a lot of local hotels and resort properties, we just lucked out that it was a Friday night and they were having an extra special finale and that I was able to catch a few of them via camera and phone. It was the perfect end to a great day! Welcome back to our fall edition of classy fashion favorites, focusing on the transition into early fall. I love everything about autumn! I grew up in the north and so miss the changing of leaves and crispness in the air early in the early morning and evenings. I love the look and feel of layering up and cozying up to a fire, baking pumpkin pie, enjoying a mug of hot apple cider or a pumpkin spiced latte and a chance to change up my wardrobe and color scheme. Most of us are not quite into the 'bundling up' weather (especially not if you live in the south like myself where we're still experiencing high 80's and 90's in Florida!) but we did get the very first hint of fall this past weekend and even though it warmed up from 62 in the early morning to 79 degrees at the peak of the day, I still rocked my riding boots and long sleeves for a change of pace. Today's post focuses on what to wear right now before it's too cold to wear open toed shoes and when a coat is truly a necessity and not just a fashion statement. Since I'm so inspired by everything fall right now, I think this is my largest 'favorites' post yet! I've been purchasing a few pieces for fall and have been most excited about getting to wear boots. These gorgeous booties arrived in the mail today and I immediately tried them on and they fit perfect so I planned today's outfit around them. Here is a pic of me wearing them and here's an up close detailed shot via Instagram. They also come in 2 other colors-navy and khaki green-I honestly want a pair in every color now! If you see your size available, I highly recommend grabbing them because they won't last and all sizes in the coffee color are currently out of stock! I read a lot of reviews before purchasing them which turned out to be true-that they fit amazingly well especially at under $100. They truly are a must-have item for the season! Whether you have a thicker ankle or wider foot (or thin ankles with narrow feet like me) you will love these because they accommodate all of the above which is rare. I ordered them in the coffee color in my usual size 9 and they fit true to size. 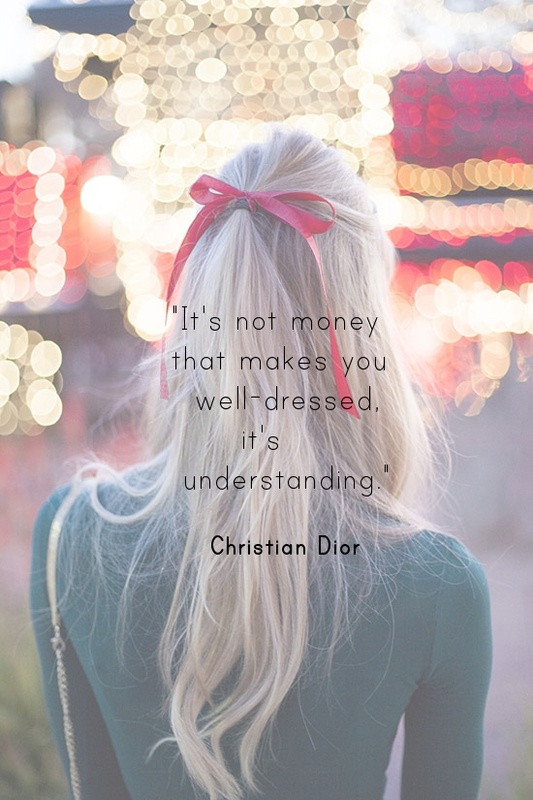 What I love most is that they can be dressed up or down-with skinny jeans (cuffed up or not), with skirts, leggings topped with a long tunic, dresses and even shorts. I'm looking forward to styling them many different ways. Speaking of boots, I'm IN LOVE with these burgundy wine color heeled boots. They are definitely an investment piece to be enjoyed for many years to come and they're at the top of my wish list right now. Loving this leather trim wool cape and wish it was within my budget-it's so classy. I love the St. John brand in general, you can always expect quality & elegance. In addition to my booties, I also recently purchased this rose midi skirt which I've seen for a while and love and this floral print dress in a heavier weight-perfect as it cools down. I also have another pair of these black patent Tory Burch sandals on their way because I wear them so much and they needed to be replaced as I wear them nearly every single day at some point-I love an easy, flat slip-on sandal for chasing after my little one. Below I'm sharing several current sales to take advantage of while you add new pieces to freshen up your fall wardrobe! ASOS: Up to 50% OFF! RALPH LAUREN: Additional 30% off for up to 50% OFF ends: 10/12.